Dazzling, colossal and colorful. From the free and generous writing to the many drawings and sketches, Jacques Prévert's hand is present throughout this entire manuscript. One can imagine the poet in 1943, in a farmhouse on the slopes of Tourettes-sur-Loup, perched over this giant sheet of notebook paper, cigarette in mouth, transforming a hole burned into the paper by his ashes into a flower or a sun. Prévert constructed this sheet as a preliminary plan to guide him as he wrote the screenplay. Prévert holds the levers to the script and dialogues for Les Enfants du Paradis — the masterpiece of French cinema, directed by Marcel Carné, and released in 1945 . Prévert pinned this sheet to the wall and drew horizontal lines to separate characters, ranked in order of importance. One can make out the character names of Baptiste, Frédéric, Garance, the acrobats, the group of mimes... sometimes accompanied by the actor names. The movie's characters and plot come to life in the jet blue ink of this tableau. The document is riddled with a multitude of colorful sketches, some linked to the film and some not. An owl, a fish in its fishbowl, an alligator, the Frères Lumière... A few humorous "aphorisms", self-evaluations of the work in progress; instructions for the next steps. 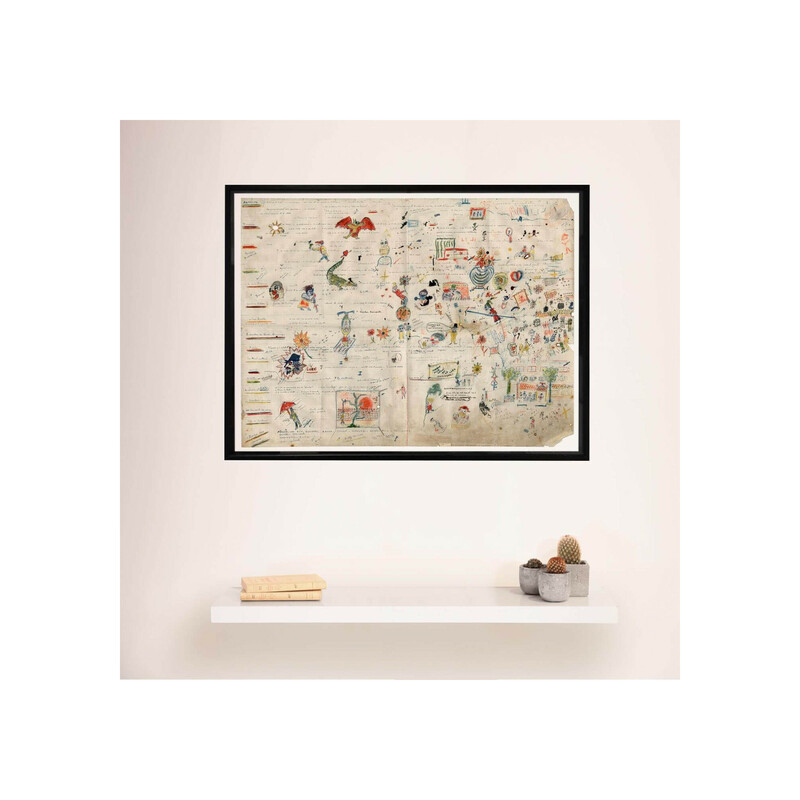 This framed manuscript is limited to 1,000 hand-numbered copies.